I'm joining Helga Weber's Friday's 10 Happy Things where bloggers list ten things that made them smile this week, so we can start the weekend on a more positive note. 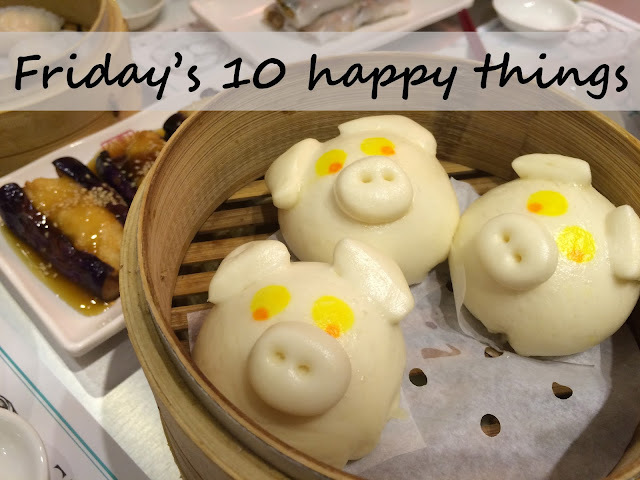 Here are my 10 happy things, in no particular order :) Thank you Helga for hosting this! 1. Goodbye, Inang- Although my heart is mourning, I decided to include my Inang's passing as one of the happy things that happened this week. I want to celebrate her life, her selflessness, her love to me, to our family. I wrote this for her while breathing in the magnificent sunset. 3. Pandora collection- I just look at this pretty little thing and my heart swells up with joy. I told a friend how I regretted buying the starter bracelet kit because I know I would not be able to fill it up with charms. I only got around to wearing it when it already has 4 or 5 charms. But after 2 years, close friends have gifted me with some charms that tell my story. 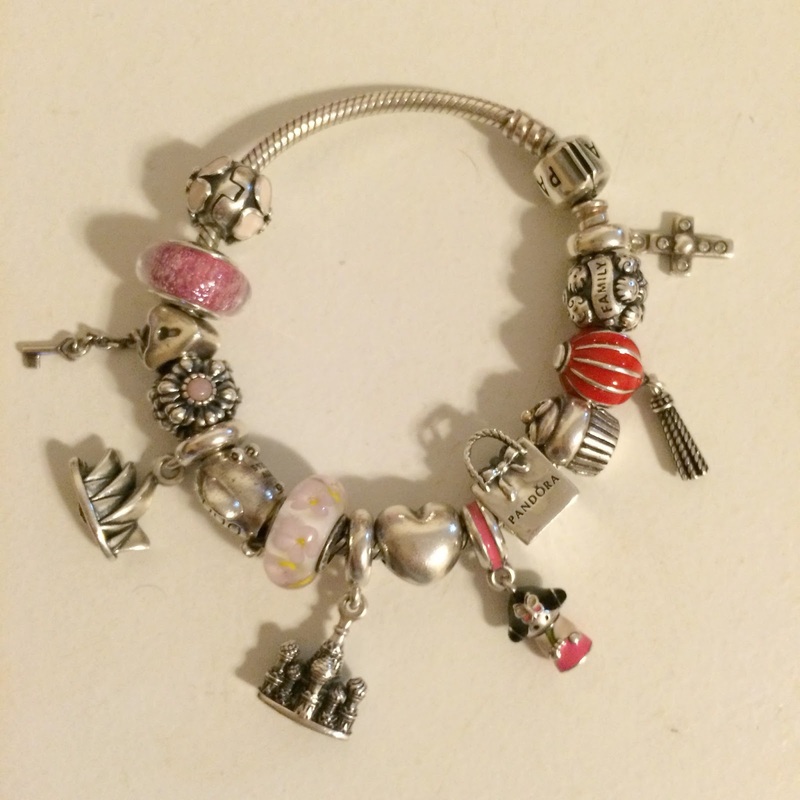 For Christmas, I bought the gliterry murano glass charm from the Disney Frozen collection. I got it last Sunday at a discounted price thanks to my churchmates. 4. Sogo voucher- I worked two weekends ago and as compensation, we were given Sogo department store vouchers. It came rather timely because Sogo and City Super were having their year-end sale. I used it mostly for groceries. 5. Chewy chocolate chunk cookies- I baked some cookies last Saturday because I was missing the comforting taste of it when paired with milk. Brought some to share with church friends. 6. Christmas lunch- My group of Filipino friends want to have a nice get together Christmas lunch and we thought of reserving a table in Shangri-La Hotel. I called in early this week and managed to make a reservation one month in advance. Looking forward to our mini gathering! 7. Bonding with the auntie- Spontaneous plans always work out. After Sunday lunch, Auntie Josie mentioned to me that she wants to see the new Breeze Mall (which is just right across from where I live), so I said I can accompany her if she wants to. It's been a long time since we went out on a 'date'. She is the closest thing to family to me here in Taipei. 8. Money talk with my brother- My eldest brother loves to spend his money on oftentimes useless stuff. We're very open about money and I always remind him to save save and save. I sent him a message this week about his 13th month pay, hoping he wont use up all of it! 9. Long conversation with Auntie Emi- I love talking to her. We talked during my entire lunch break yesterday and I didn't feel hungry at all hahaha. I cannot wait to visit her in the US soon. 10. Piggy custard buns- Dimdimsum Hong Kong has just opened their first branch here in Taipei. We lined up for a few minutes after work last Wednesday and tried their chef's recommendations. Was just sad I had to eat the poor piggy! Hope y'all have a lovely weekend! 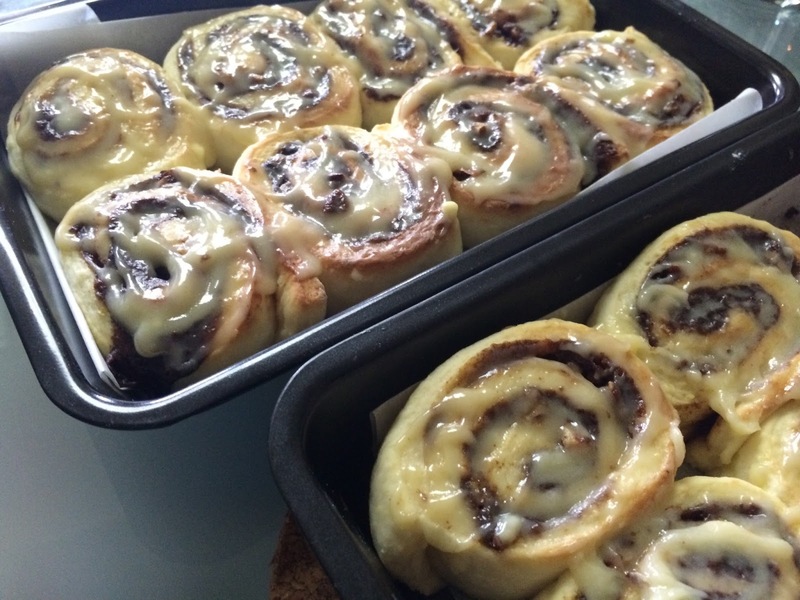 Is there anything more comforting than the smell of cinnamon rolls baking in the oven on a cool autumn day? Go ahead, pour yourself a cup of freshly brewed coffee, grab a plate and eat a few forkfuls of piping hot cinnamon roll and just lounge around in your pajamas. It will sure be a perfect day, no matter what. 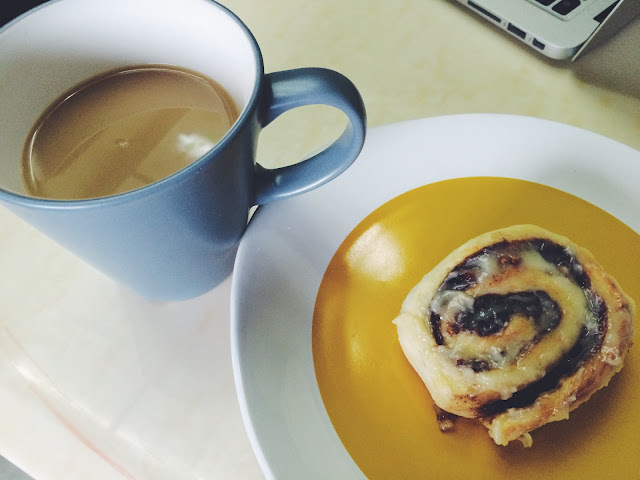 There is always something about cinnamon roll that keeps my heart fluttering. Perhaps it gives me a sense of familiarity as it reminds me of home, of those days I warm Cinnabons in the toaster for my merienda, or those dreary office mornings when I'd race to Starbucks Salcedo to grab a Cinnamon Swirl. I don't know but it brings a warm fuzzy feeling. Cinnamon rolls are hard to come by here in Taipei. The closest thing to Cinnabon would be Costco's Cinnamon Rolls which are sickeningly sweet and a little on the chewy side. Ikea has them too, but without the glaze, and so does Hogan Bakeshop in Eslite Xinyi. And so after a long unsuccessful search for a good Cinnabon-like cinnamon roll, I tried a random Cinnabon-copycat recipe one day in April and I've never bought Costco's rolls ever since. 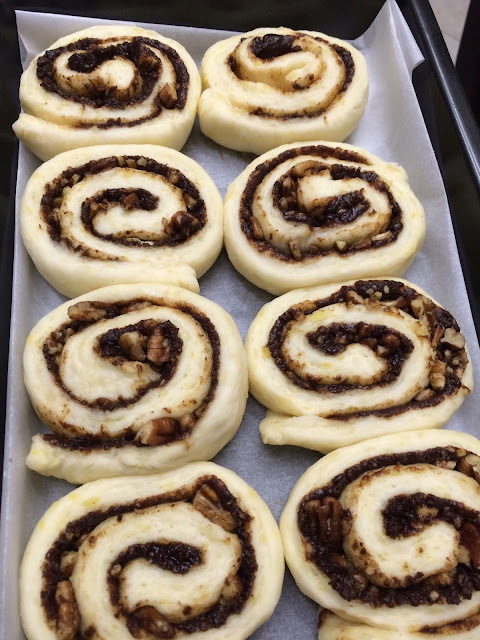 I have made this recipe a total of four times and it always comes out the same- soft and pillowy rolls, not too sweet and the glaze is just perfect. 2. Add sugar, butter, salt, eggs, and flour to the bowl of a mixer and mix well. 5. Roll the dough out on a lightly floured surface, until it is approx 16 inches long by 12 inches wide. It should be approx ¼ inch thick. 6. Preheat oven to 350 F degrees. Grease a 9x13 inch baking pan. 7. To make filling, combine butter or margarine, brown sugar and cinnamon in a bowl. 10. Place the cut rolls in the prepared pan. Cover them with a damp towel. Let them rise again for another 30 minutes until they double in size. 13. When the rolls are done, spread generously with icing. Serve hot. I'm back on the mat. After more than 2 years of no serious physical activity (leisure walking and biking do not count), I finally signed up with Pure Yoga. I quit my yoga practice in 2013 when I changed jobs because my schedule was packed. I was then with Royal Yoga's Fuxing North Branch. My favorite teacher also left Royal and I was not inspired to attend classes anymore. I would sometimes practice at home but I lacked motivation. After two big work events, my body needed a break. I wanted to sprawl out on a mat and stretch every inch of my body. I decided to look up Pure Yoga Taipei online and filled out their form for a free trial class. I was bracing myself for some hard-sell marketing and sales promotion (surprisingly, they were a little more gentle than Royal), so I requested for a few days to give it some thought. The monthly fee is quite expensive and I didn't want to throw away my hard-earned money. From what I gather, Pure Yoga and Space Yoga are the two most expensive studios in the city. However, after a few sessions with Pure, I was totally sold. Their teachers are highly qualified and trained. They know how to teach and interact with the students. My issue with my previous yoga studio is that the teachers cannot explain properly how to do the posture. We just imitate what they do, without knowing if we're doing it correctly. I also appreciate that their teachers take time to discuss the benefits of every posture in class.They ask beforehand if somebody has undergone a surgery, or if students have health concerns they would want to raise. The classrooms and lockers are immaculately clean. No funny scent or sweaty smell inside the classrooms. The lockers are digital so there is no need to bring your own padlock (hello, I'm lookin at you, Royal). There is more than enough shower cubicles, hair dryers, cotton pads and all bath essentials. I haven't seen girls line up and wait for their turn to shower. But the real downside is the price. When I signed the contract last week, I made a commitment to myself for my membership fee to be worth every cent. I promise to always be motivated like I was back in 2013, when I would wake up early in the dead of winter just to attend my favorite teacher's 7:15am Vinyasa class. Hopefully I'll find the same inspiration again. Yoga on, dear self! It's Christmas time in the city! My personal life has taken a back seat lately. I did not even notice they've lit up the trees in the area where I live- which is the only area in Taipei that feels and looks Christmas-y. After the Hong Kong Conference, we were terribly busy with another annual conference for the bankers. I did not have much time to go out after work, save for the hour and a half-long lunchbreaks that we have which I usually use to wander the shelves of Eslite Book Store. Last week I found myself at the 4th floor level of Eslite, surrounded by planners of all size, shape and color. I was reminded that the year is winding down. Had I been in Manila, I would have started collecting stickers for the much-coveted Starbucks planner. In Taiwan, Starbucks sells their planner for around NT$400 to NT$500- that was the price last year for their leather-bound planner. Taiwanese in general have an obsession with datebooks and planners, especially those cutesy colorful ones. And they don't come cheap! I saw a famous Japanese brand costing around NT$2,500. So while scouring through a stack of datebooks (the cheap ones of course), I accidentally found the 2016 version of my current datebook. Yes, yes, it looks cheap and childish, but it is cute and very practical! 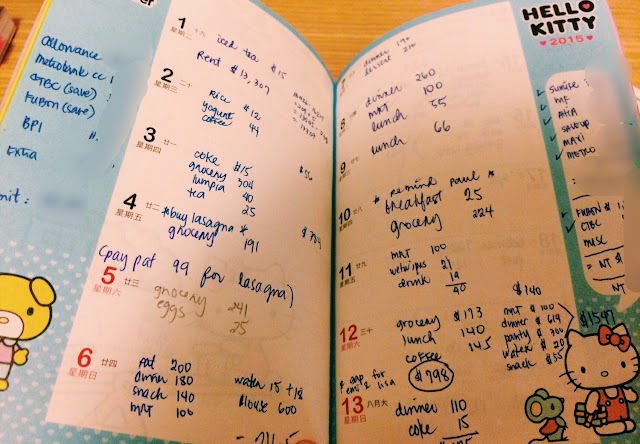 I don't really use it as a planner, but more of an expense diary. An ate from church gave the 2015 planner to me as a present because she knows I like all things Hello Kitty. It comes with a sturdy plastic cover which protects it from wear and tear, especially since it has found a permanent home in my handbag. I was surprised that it only costs NT$80, with 10% discount for Eslite Members so I paid only NT$72. I particularly like the ample space in every page (and the cute Hello Kitty prints haha, it comes with stickers too). I write down my daily expenses and in one of the side columns, I create a summary of all the bills I have to pay and the amount I have to remit to my Philippine bank account. I'm currently waiting for my Daykeeper 2016 which will be hand-carried by a friend visiting Taipei next month. My journal, Daykeeper 2015, is now well-filled with photos, memories and notes about my travels and other stories. When you have a big jar of Nutella in your pantry that is about to expire, you run to Google for help and key in words like "recipes with Nutella." We wanted a no-brainer, one-bowl recipe so the three-ingredient Nutella Brownies from Buzzfeed was just perfect. We actually made it into a four-ingredient recipe by throwing in a cup of chopped pecans (we have 3 bags of Kirkland Pecans sitting in the kitchen cabinet), to add a bit of crunch and to balance the sweetness. They turned out really good and not overly sweet. 1. Preheat oven to 350F or around 177C. Grease or line a rectangular baking pan. 2. Mix Nutella and eggs, adding one at a time until well combined. 3. Add in the flour to the mixture. The batter will be thick, gooey and chocolatey. 4. Fold in chopped nuts. 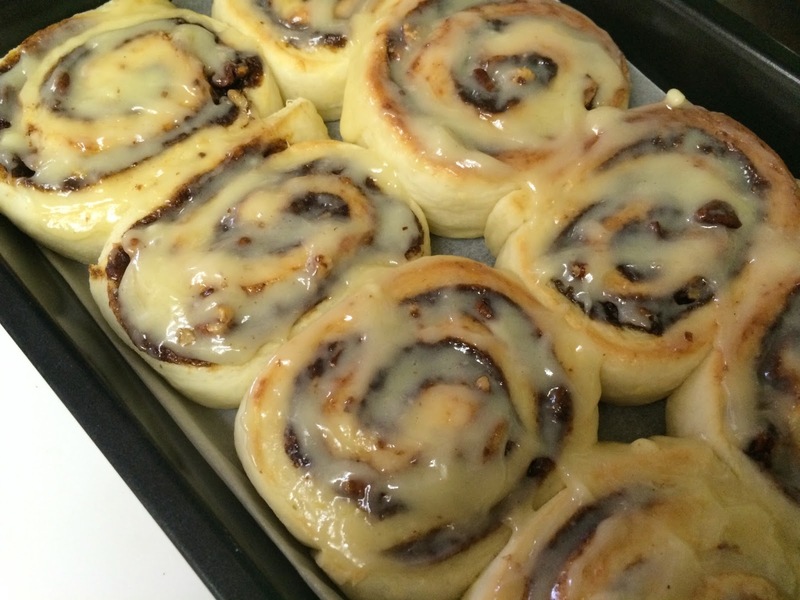 Spread batter on pan and bake for 15 minutes at 350F. Do not overbake as it will become dry and crumbly. 5. Cool and cut into squares. 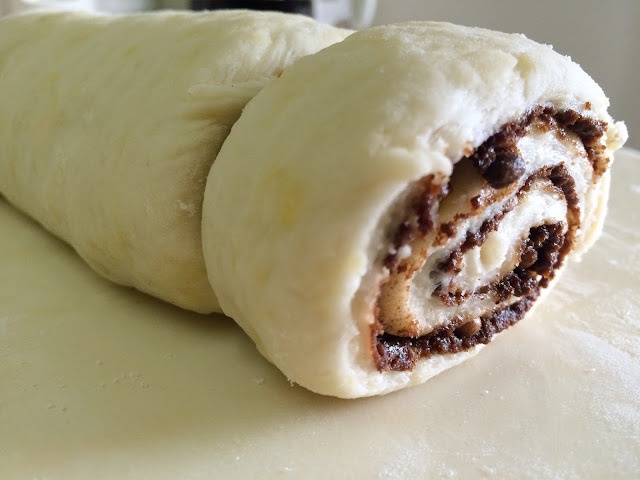 For those who are wondering why this recipe only has three ingredients, Nutella plays a key role here by taking the place of sugar and butter. They are so easy to make and so yummy too! Try it and let me know how it turns out! One blogger shared a four-ingredient Chewy Nutella Cookie recipe, and it looks as good too. Will try it next time. People would often tell me how envious they are with my work because I get to travel a lot. I usually just answer with a shy smile but deep inside I say to myself they do not know the unglamorous side of it. Sure I get to see places I never imagined traveling to in my lifetime, but there are times when I also get tired and cranky. This morning I came across this article from The Financial Diet (TFD) and it quite sums up what I feel and go through each time I 'travel for work'. I arrived last Sunday from Hong Kong. We organized an event (a big one if I may add, with more than 250 attendees) and we were on our toes from October 28 to November 1. When I reached home, I unpacked my luggage, sat down for a bit to rest then took a long shower. I was off to dreamland at about 10pm and boy it was the best sleep I've had for days. If it wasn't for my alarm clock, I wouldn't have woken up in time for work the next day. It takes me a couple of days to recover from a business trip, or a week even for long-haul flights. There is the preparation part- the laborious coordination with our counterparts, speakers and participants which takes months, all logistical arrangements, packing materials to bring, and packing my own stuff. Most often than not, we have a scheduled meeting hours after arriving at our destination, followed by early morning calls, business lunches and late dinners. Sometimes, it does not matter if we stay at a 5-star hotel because we don't get to use the amenities anyway. We are lucky if the hosts are generous enough and would offer free tours. This is the only time we get to see some of the city's main attraction. Then we fly back home, unpack, prepare written reports (liquidation is my least favorite part), answer a gazillion of work emails, etc etc. 1. The key to avoid work travel burnout is proper rest and good sleep. I agree with the TFD author when she said you have to rest days leading to your scheduled travel and after your trip. I'd say getting a good sleep before, during and after is also helpful. Sleep will allow you to function well and think clearly during meetings and presentations. It will also help you feel less exhausted during the entire duration of your trip. 2. Take time to recover. I am a little close to the burnout phase and my backaches are getting unbearable. After a business trip, I would not usually go out for two to three days to allow my body to just rest and return to its "regular programming." If I have some cash to spare, I would have a 40-minute massage at this tiny spa just below my apartment. Right now I have a feeling my back needs a good gentle stretch so I signed up for a free yoga trial class tomorrow at a yoga studio nearby. I did yoga before but I quit after switching jobs. 3. Pack smart and travel light. Packing is such a chore but we cannot get away with it. I would first check our destination's weather and prepare my clothes three days ahead. I usually pack the right number of undies plus one or two extra just in case. I'm not comfortable wearing disposable ones but that's just me, you may opt to use them for convenience. I prefer dresses for work trips because they're easier to wear and lighter to pack. I just throw in a coat/blazer for a more polished look. I bring a pair of flats (which I wear during the flight) and a pair of black heels. I carry my own toiletries because I once had an allergic reaction to a shower gel of a hotel many years back. 4. Don't forget to enjoy. Work trip is not a vacation, but you must also enjoy. Take advantage of free time in between meetings to have a short walk around the city or interact with the locals. You may even ask your local host for recommendations on which places to visit or restaurants to try. If your company allows you to extend for a day or two, that should give you enough time to tour. For this trip to Hong Kong, our boss allowed us to join the optional tour to Macau (he also agreed that the company pays for it-- thank you!!!). These little things inspire me to work even harder for him and for the organization. And now some shots taken during my recent travel for work. We watched Franz Harary's House of Magic Show in Studio City, Macau. It is a pretty Hollywood-inspired casino which opened October 27. After the show, we went to Sands where I was stopped at the entrance. I told the ladyguard I was born 1988 but she wanted to see my ID. She checked my residence card and stared at me for a few seconds before apologizing. Oops. These are small wishing lanterns at the Mazu Temple in Macau. I think they are selling these for 20-30 HKD apiece.